Recently Anastasia of Lipsticks and Lightsabers did a post showing a new indie company called Shiro Cosmetics. The thing that caught my eye first and foremost were the names as well as the packaging, names like Link, Pikachu, Zora, and Jigglypuff to name just a few. 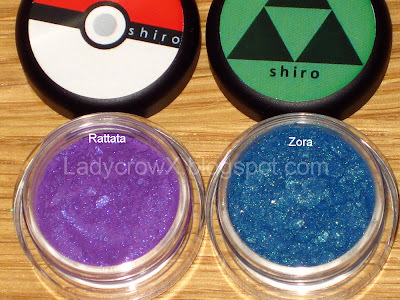 I mean how cool...makeup named after characters in video games how could I not love that? 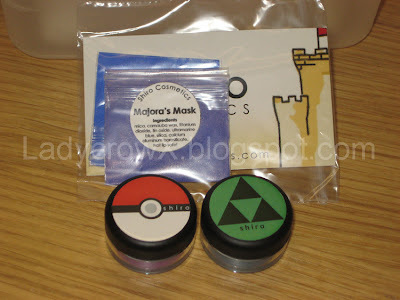 Then I saw the packaging, full size jars are labeled with stickers of a tri-force or a Pokeball! That's just awesome! I grew up playing Zelda.....and pokemon I remember watching too, as well as playing around with the games. These are cool looking/sounding shadows, why the hell wouldn't I want to catch them all? 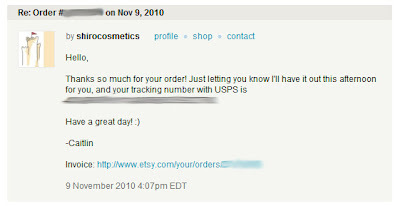 Anyway, I received my order on November 12th, 2010 around 4pm....I think I would of actually received it on the 11th but that was a Holiday so the USPS was not working that day. Again impressed at the quick shipping time. I jumped up and down and couldn't wait to open it and start snapping pictures to blog about. When I opened it I was impressed to see how nice it was package, nothing out of order everything neatly packed in a pretty bag with a business card attached. I then started to open the bag and realized on the back of the business card there was something written. 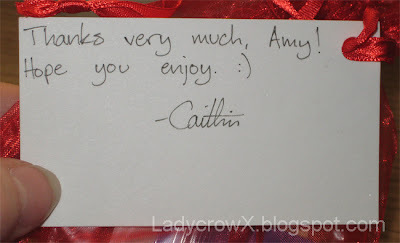 I definitely love the little handwritten notes from companies I buy from, it adds personal touch to it which you don't often see now days with the bigger companies. I was originally mulling over getting Majora's Mask but I didn't see an option to buy that one as a single full size (possibly my own fault because I've never bought through Etsy before lol). I was ecstatic to see that she included 2 free samples and one was Majora's Mask. :) Again everything neatly packed and nothing broken or out of sorts! 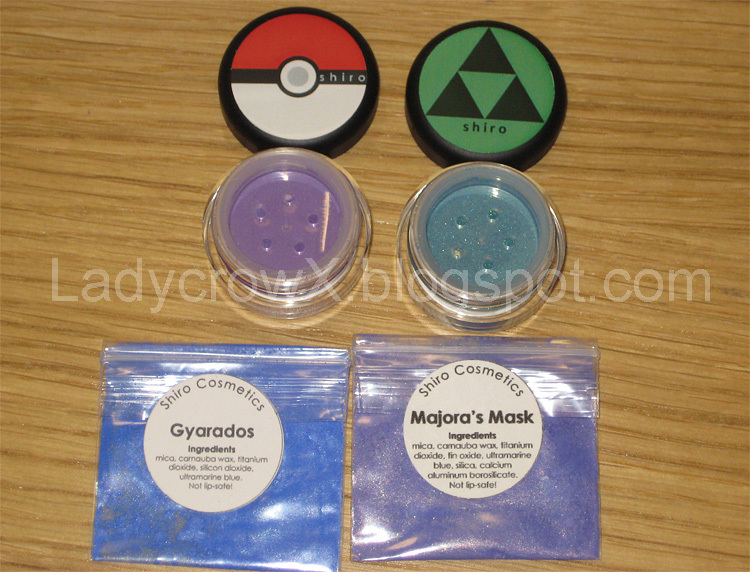 Note: I showed my man (also a gamer not into makeup) a picture of the jar labels on Ana's site and he said "I love the tri-force one!! Those are awesome!" 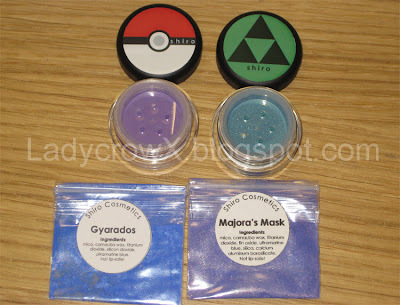 "You will receive a 5-gram jar, packed full of shadow, with a sifter. This is not the same as 5 grams of product, as it's packed by volume, not weight. Depending on the density of the shadow, you'll get between 1.8 and 2 grams - enough to last you a very, very long time! Individual mini and sample sizes are available on my website, shirocosmetics.com." 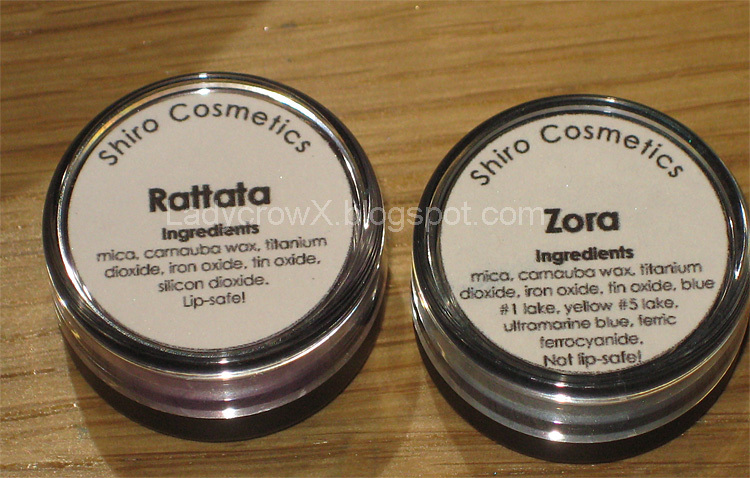 The bottom of the jars and labels on the sample baggies show the name of the shadow as well as the ingredients. I like the labels on the sample baggie as it is almost a cardboard material which I could remove and stick onto a jar if I decide to transfer from the baggies. The price varies depending on how many shadows you purchase, samples range from 15 for $12.75 all the way up to 30 for $24.00, single full size jars are $5 for singles or 10 for $45.00 up to 15 for $63.75, mini jars range from 5 for $13.50 all the way up to 30 for $72.00. I find the prices very reasonable for the amount you get. Anyway let's get to the swatches so you guys can see the pretty product! 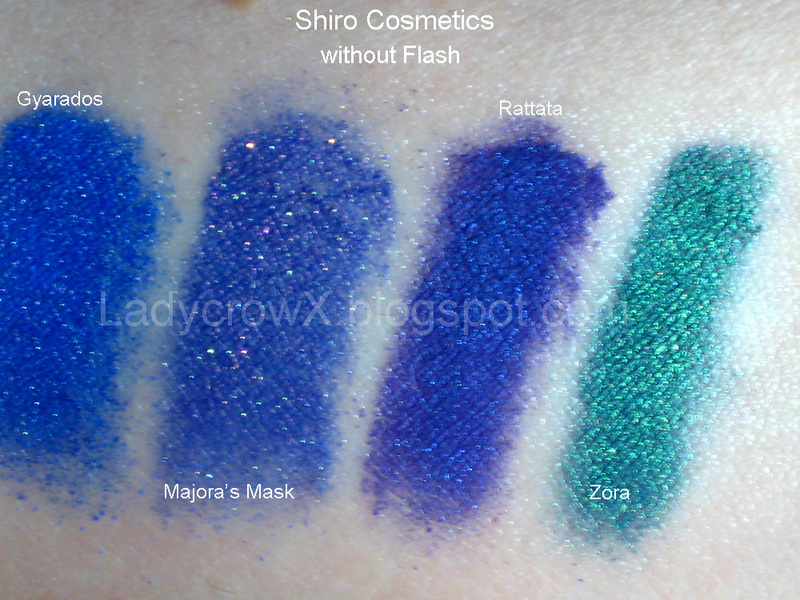 Note: swatched over Fyrinnae's Pixie Epoxy. 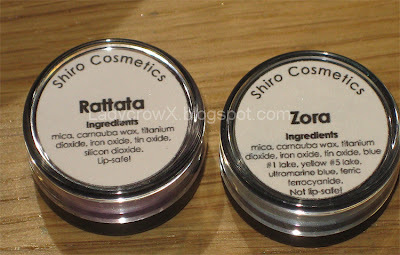 I found the shadows to be easily applied, not chalky, I haven't tried a look with them yet but I plan to shortly, so far I can say I can't wait to see what is next for Shiro Cosmetics...what new collection will they release? So excited to see and can say so far from what I can see this is company isn't just a pretty cool package...it's a pretty awesome product too! Price? 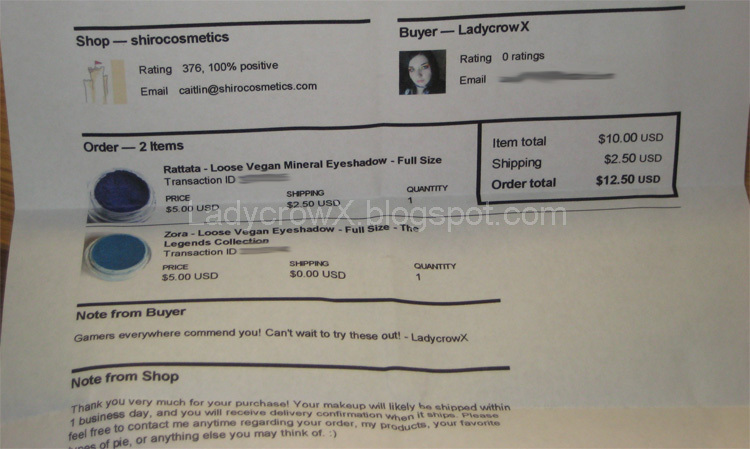 definitely reasonable, shipping was only $2.50, and the store shows shipping to everywhere else outside of the US as $3.50. Packaging? neatly packed, nothing spilled, love the little personal touch and the bag, the labels are awesome! Product? 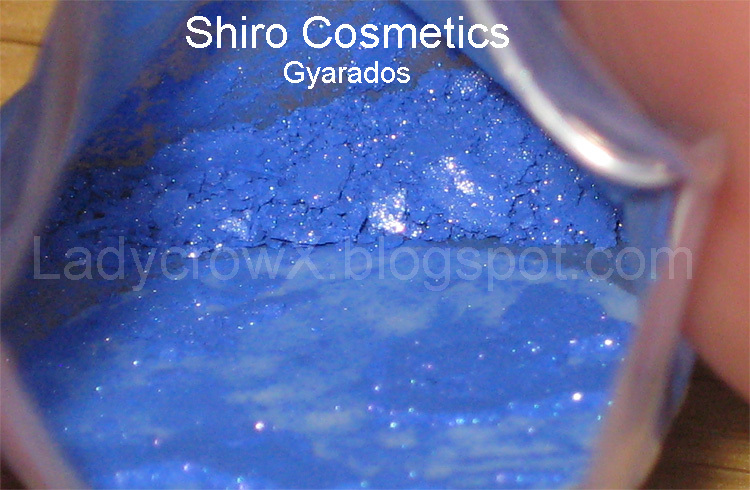 Vibrant, goes on smooth and seems to blend well. 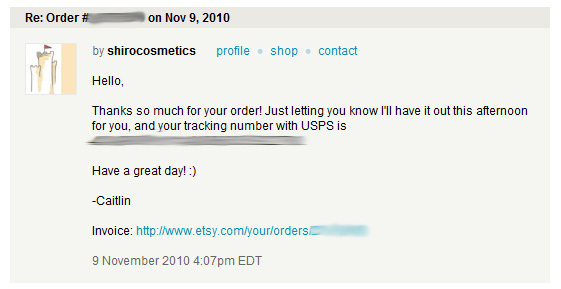 She is always fast with shipping. 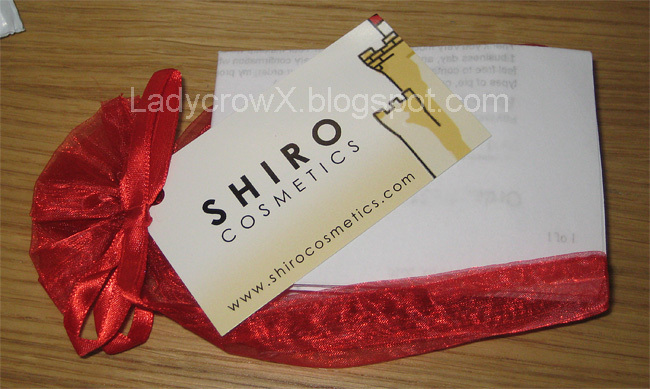 One time both me and my other writer on my blog ordered pretty much at the same time and when she didn't get hers and found out it was lost in the mail Shiro got straight onto it and shipped new ones straight out with excessive extras to apologise for the small wait. OMG! These are too gorgeous for words. I love the color combination of the 4 of these, I think they'd look awesome all together! 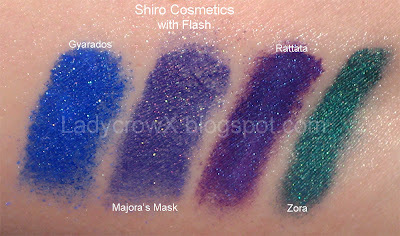 Man...I don't know how much longer I can resist ordering from Shiro. 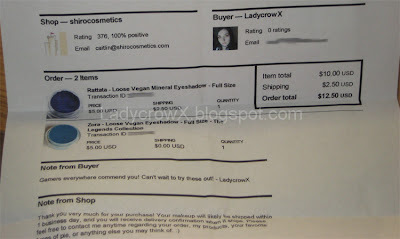 I'm pretty much on a no-buy, but...the preeeeeeetty, it calls to me! Not to be a superstalker or anything, but I happen to have all those colors and I know, they're soooo gorgeous! 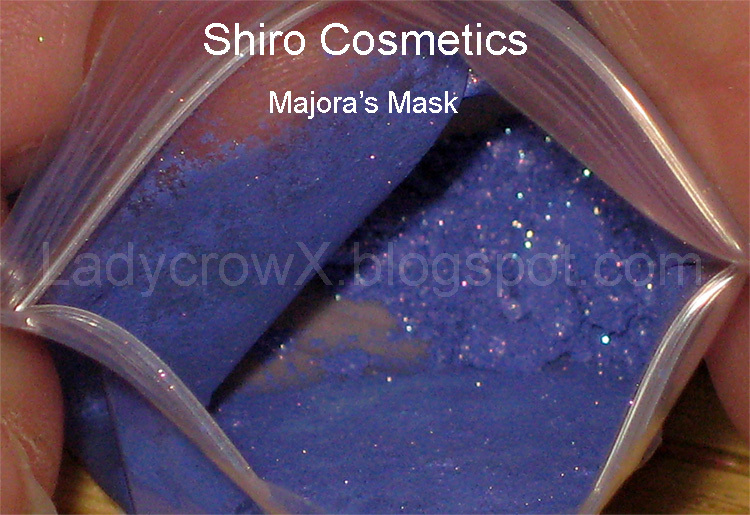 I had thought Gyarados would be my ultimate blue, but Caitlin included Majora's Mask as my free sample and it's amazing. I've also had reason to contact her on more than one occasion and have always found her replies to be prompt, helpful and professional. She also sold me extra stickers so I could pwn my other makeup jars :D More colors that are total win include Gengar, Ganandorf, Temple of Time and Link (ultimate matte-ish forest green). Oops, forgot to mention Veran. It's navy blue but with the most incredible range of sparkles in it ... a must-have! !